Jeremy Turner graduated from the Royal Free Hospital School of Medicine in 1993, gained membership of the Royal College of Physicians in 1996 and commenced speciality training at the Royal Post Graduate Medical School, Hammersmith Hospital. In 1999, Dr Turner was awarded a Medical Research Council Clinical Training Fellowship and undertook research into molecular genetics of endocrine and metabolic disorders at Oxford University. After moving back to London and becoming interested in the emerging field of metabolic inflammation, he was awarded a British Heart Foundation Intermediate Fellowship in 2005. Between 2005 and 2009, he was Senior Lecturer at Imperial College and Honorary Consultant Physician at Charing Cross Hospital in London. During this time he studied the role of adipose tissue inflammation in obesity, insulin resistance and type 2 diabetes. It was also during this time that he developed his clinical sub-speciality interest in diabetes and obesity. 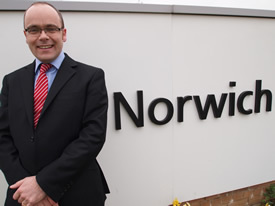 In 2009, in order to get back to more full-time clinical practice, he moved to the Norfolk and Norwich University Hospital to take up a post as consultant diabetologist and endocrinologist. Jeremy and his wife - a GP - and three children live in the centre of Norwich. He continues to have an active research interest in adipose inflammation and mechanisms of insulin resistance and is currently supervising two research students in this field. Diabetesbible has recently been edited and updated by Dr Nick Clarke, in collaboration with the author. Nick is a junior doctor on the Academic Foundation Programme at the Norfolk and Norwich University Hospital. We extend our thanks to him. Diabetesbible is a collaboration between Dr Turner and Ruby Media, specialists in digital health publishing, which also runs Endobible and Hospital Dr. This website was designed and built by Creative Hat.